This lesson discusses the fact that Satan is literally real, which he indeed is. However, SDA teaching seems to have the opposite error of scaring people into worrying every minute that they have prayed off Satan’s power or effects. Satan is not on a level playing field with Jesus as frequently depicted; instead Jesus is God and therefore completely sovereign over everything Satan is permitted to do. In discussing the hope Paul has that the Lord is faithful to strengthen and protect, a grave error is made tying together 2 Thessalonians 3:1-5 with Luke 10:25-28 and Deut. 8:1, and asking the question “what is the condition upon which we can be certain to claim it” (speaking of hope). The implication is that we keep the Law and then God can hear our prayers, provide for us, and ultimately save us. And yet many SDA’s say their church no longer teaches this and instead teaches faith alone. 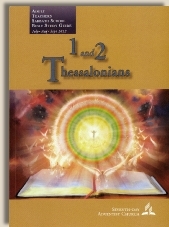 Here in this very lesson, a condition is placed on when or if God will act on our behalf while 2 Thessalonians 3:1-5 leaves out conditions. Deut.8:1 doesn’t even speak of eternal life, only possessing the land God swore He would give to the Israelites, and even SDA’s would admit (and Acts 15 concurs) that not all God commanded the Israelites applies to Christians today (i.e. animal sacrifices, not cutting one’s beard, not mixing cloth types in same garment, etc.). Therefore it is taking the verse out of context to give that as a condition for Christians to count on God for intervention. Luke 10:25-28 is really about Jesus calling the lawyer to recognize he falls short (as we all fall short) of fully loving God and others. Since the requirement for eternal life is to perfectly keep God’s Law (love God, love man from the heart) and only Jesus has done (and can do) this, we have to recognize our need for our Savior and accept His righteousness credited to our account in place of our sins. Only Christ’s perfect obedience can qualify us for eternal life. Monday’s lesson ends with asking how we can learn to have this faith, hope, and certainty for ourselves (as Paul did) regardless of difficult circumstances. That is another mistaken SDA assumption that we can learn these things (as we can learn knowledge) or prepare ourselves for future difficulties when the biblical teaching is that God provides both faith (Hebrews 12:2 and Romans 10:17) and hope (Romans 15:13). He also provides perseverance and proven character through tribulations (Romans 5:1-5). We can’t learn and prepare ahead of time; God brings us through our problems and we come out the other side with greater faith, hope, certainty and proven character.